GreenBeanTeenQueen: Nominate for a YALSA Award-Including Printz!!! Nominate for a YALSA Award-Including Printz!!! Look at that shiny Printz seal!! Isn't it so pretty?? Wouldn't you love to see some of your favorite books of the year get some award love? You can help! 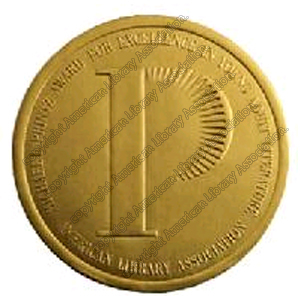 Did you know that anyone can nominate a title for the YALSA Book and Media Awards? (Ok, well not publishers or authors-but anyone else!) You can nominate your favorite survival films for Fabulous Films for Young Adults, or nominate your favorite 2012 read for Best Fiction for Young Adults, or nominate the best audiobook you listen to this year for Amazing Audiobooks. Did you know you can even nominate a title for the Printz Award? Yep, field nominations from anyone are encouraged for all these awards and more!! And it's easy to nominate a title-just fill out the form on the YALSA website, tell a little about the book you're nominating-and that's it-your nomination is off to the committee!! You don't want your favorite books being overlooked by a committee and not getting some award love come January, do you? Kelly at Stacked has a great post about what happens when we fail to do our part in field nominations-and remember-anyone can nominate a title ! !